We offer to buy Acer 35" a monitor with UWWQHD 3440x1440 resolution. LED lighting provides high contrast, great lightness and minimum power consumption, besides the enclosure of LED monitors is much thinner and more elegant than that of the devices of older generations. The compatibility with the modern graphics cards and video players will be ensured by HDMI input. 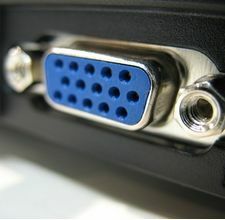 DisplayPort port ensures the receipt of a higher quality picture from the computer graphics card supporting this technology. VA panel provides high colour compatibility parameters and improved viewing angle to this monitor. The speakers system built in the monitor allows to listen to music and enjoy films with sound without making it necessary to buy additional speakers. Thanks to the 4ms fast response time this monitor will be an excellent choice for enjoying dynamic games and films. The size of the monitor screen is measured in inches across the diagonal. The screen size must be proportionate to the resolution of the screen for achieving the maximum utilisation of the desktop and details of the image. Mainly two forms of LCD monitors are available: with standard width and height proportion 4:3 or the widescreen proportion 16:9 or 16:10. A widescreen monitor is wider and its resolution is higher than that of the monitors with standard proportion. The bigger the monitor size the higher resolution usually is supported. Possibilities to increase the resolution of the screen usually depend on the size and possibilities of the monitor and the type of the video card. The resolution of the monitor screen determines the number of colour dots (pixels) a monitor can display. It refers to the clarity of the text and images displayed on the screen. The higher the resolution the sharper the items look. The applied resolution depends on the resolution supported by the monitor. LCD monitors, including the screens of laptop computers usually work best if their local resolution has been set. The setting of this resolution for the monitor is not mandatory, but usually it is recommended to set it for ensuring the highest possible sharpness of texts and images. The bigger the monitor size the higher resolution usually is supported. Possibilities to increase the resolution of the screen usually depend on the size and possibilities of the monitor and the type of the video card. Teh monitor panel is the main feature of the visible part of the screen or the technology where the display of the colour dots (pixels) is implemented. TN is the standard technology with average contract, brightness and colour compliance indices. IPS is the matrix with high colour compliance and good response speed, therefore it is well suited for graphics tasks and photo editing. IPS matrix provide an excellent viewing angle maintaining the colours and contrast from almost any angle. VA matrix ensures superior colour compliance, however, the response time of this matrix is lagging behind that of the IPS and TN; the viewing angle is somewhere between both these technologies. The TN type monitor is fully sufficient for an average user. If you have more money available the VA or IPS can be chosen. The response time of the monitor screen determines how fast the monitor will display moving images (films, games, animations, etc.). The response time is measured in miliseconds. The less the response time the better the ability of the monitor to display moving images. recommends to buy monitors with 5ms response time or lower. Ikdienas vajadzībām iesaka iegādāties monitoru ar gaišumu, ne mazāku par 250 cd/m2. D-SUB is the classic (analogous) monitor connection plug. This standard is gradually disappearing from the market giving the place to the higher quality HDMI or DisplayPort (digital) plugs. If the resolution of the monitor is FullHD or below the average user will experience no problems with this connection. Those who want to achieve higher image quality and resolution should look for the monitor with the DisplayPort or HDMI connection slot. DisplayPort is the digital connection for transmitting the image via a single wire at a high quality level. Contrary to the HDMI, this connection allows to connect several external monitors to the computer via a single connector. Prior to buying the monitor with the DisplayPort you should verify whether your computer has the DisplayPort plug available! DVI is a digital standard and ensures high image quality, however, thanks to the big size of the plug and the inability of the standard to develop further due to a few technical restrictions this type of connection is gradually losing its popularity to modern HDMI and DisplayPort standards. DVI is compatible with HDMI and transitions of both directions are available. DVI is not compatible with DisplayPort, however, there are DualMode DisplayPort connectors which contains the HDMI/DVI signal, and in the relevant direction DisplayPort -> DVI can transmit an image. If the monitor resolution exceeds 1920px in any direction a graphics card with the DVI-D Dual Link support and the relevant quality cable will be required. Before buying a monitor you should verify whether your graphics card has the corresponding connection slot! HDMI is the digital high quality image transmission standard that allows to connect the monitor to the computer via a thin cable by using an elegant small-size connector. HDMI is compatible with DVI if the relevant transition or cable is used. Some monitors may have built-in speakers that quite often allow to give up external speakers thus freeing a space on the desk and saving money. The sound quality of built-in speakers is quite moderate and therefore we recommend to use this possibility just for infrequent needs. For enjoying music, movies and games we recommend buying the corresponding quality and capacity speakers. Screen size (diag.) - 35"